This working meter can be used to demonstrate the working principle of AC or DC ammeters and voltmeters with the interchangeable plastic scales, available separately. Basic sensitivity is 5mA, 100mV. It is housed in a ABS plastic case with glass front and rear. Size: 30 x 15 x 30 cm. Scale inserts: 0-100 mA (DC); 0-300 V(DC); 0-1A (AC); 0-300 (AC). Package of four. 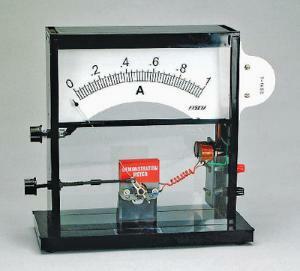 Scale inserts: 0-1A (DC); -10 to +10 V (DC). Package of two.